Can you make more money as a real estate appraiser? I got this one out a little late, sorry about that! Must apply today or tomorrow at the latest. You will perform the more complex appraisals for the purposes of acquiring real estate interests for civil works projects of the District and for other government agencies. Appraisal assignments cover properties to be acquired for navigation purposes, flood control projects, hurricane protection, environmental protection, wetland creation, river and harbor projects, marsh and coastal restoration, and fish and wildlife mitigation. You will Independently perform appraisals of real property for project studies, land acquisition and property management purposes. You will also be required to review appraisal reports and cost estimates prepared by staff and contract appraisers for project studies, realty interest acquisition, condemnation proceedings and property management. Also maybe required to act as an expert witness in Federal court for the government. Appointment is subject to the completion of a favorable suitability or fitness determination. This is a Career Program (CP) 58 position. Salary includes applicable locality pay. Failure to provide all required information as stated in the vacancy announcement may result in an ineligible rating or may affect the overall rating of your application. Payment of Permanent Change of Station (PCS) costs is not authorized based on a determination that a PCS move is not in the government’s interest. A relocation/recruitment incentive may be offered. This position requires pre-employment financial disclosure and annually thereafter in accordance with DOD Directive 5500-7-R.
GS 12: One year of specialized experience equivalent to the GS-11 grade level in the Federal service which includes experience: 1) preparing appraisals of various property types with consideration of the three approaches to value which includes a)cost, b) income, c) sales comparison AND; 2) appraising partial takings or partial interest acquisitions AND; 3) experience preparing appraisals in conformance with the Uniform Standards of Professional Appraisal Practice (USPAP) and/or the Uniform Appraisal Standards for Federal Land Acquisitions (UASFLA). This definition os specialized experience is typical of work performed at the next lower grade in the federal service (GS-11). Some federal jobs allow you to substitute your education for the required experience in order to qualify. For this job, you must meet the qualification requirement using experience alone — no substitution of education for experience is permitted. Qualification requirement: Qualifications must be met by the closing date of this announcement. Multiple positions may be filled from this announcement for up to 180 days after the closing date of the announcement. Interagency Career Transition Assistance Program (ICTAP). If you are a Federal employee in the competitive service and your agency has notified you in writing that you are a displaced employee eligible for ICTAP consideration, you may receive selection priority. To receive selection priority for this position, you must: (1) meet ICTAP eligibility criteria; (2) be rated well-qualified for the position with a score of 90 or above; and, (3) submit the appropriate documentation to support your ICTAP eligibility. Additional information about the program is on OPM’s Career Transition Resources website. The documents you are required to submit vary based on whether or not you are eligible for preference in federal employment. A complete description of preference categories and the associated required documents is in the Applicant Checklist (External). Your resume may be submitted in any format. If you submit more than one copy of your resume, only the most recent version will be reviewed. The latest timestamp will be used to determine which version of your resume is “most recent.” It is your responsibility to check the status and timestamp of all documents you submit as part of your application. For qualifications determinations your resume must contain hours worked per week and the dates of employment (i.e., HRS per week and month/year to month/year or month/year to present). If your resume does not contain this information, your application will be marked as incomplete and you will not receive consideration for this position. NOTE: Documents submitted as part of the application package, to include supplemental documents, may be shared beyond the Human Resources Office. Some supplemental documents such as military orders and marriage certificates may contain personal information for someone other than you. You may sanitize these documents to remove another person’s personal information before you submit your application. You may be asked to provide an un-sanitized version of the documents if you are selected to confirm your eligibility. A career with the U.S. Government provides employees with a comprehensive benefits package. As a federal employee, you and your family will have access to a range of benefits that are designed to make your federal career very rewarding. To apply for this position, you must complete the online questionnaire and submit the documentation specified in the Required Documents section below. To begin, click Apply Online to create a USAJOBS account or log in to your existing account. Follow the prompts to select your USAJOBS resume and/or other supporting documents and complete the occupational questionnaire (https://apply.usastaffing.gov/ViewQuestionnaire/10107098). To verify your application is complete, log into your USAJOBS account, select the Application Status link and then select the more information link for this position. The Details page will display the status of your application, the documentation received and processed, and any correspondence the agency has sent related to this application. Your uploaded documents may take several hours to clear the virus scan process. The Department of Army provides reasonable accommodations to applicants with disabilities. If you need a reasonable accommodation for any part of the application and hiring process, please notify the servicing civilian personnel unit. Your requests for reasonable accommodation will be addressed on a case-by-case basis. The documents you submit must support your responses to the online questionnaire. If your application contradicts or does not support your questionnaire responses, you will receive a rating of “not qualified” or “incomplete application” and you will not receive further consideration for this job. This entry was posted on Wednesday, January 17th, 2018 at 11:43 am and is filed under Appraiser Jobs. You can follow any responses to this entry through the RSS 2.0 feed. Both comments and pings are currently closed. Top 46 companies list send me 90% of all my AMC work. Get them both together and SAVE! We hate spam just as much as you do. If not more! and additional chapters on recession proofing your appraisal business, getting more estate appraisal requests and search engine marketing. First 37 on the list send the most work, First 10 on the list are currently my BEST clients. 2019 Appraiser Marketing Guide and List of 11,000+ Direct Lenders, Credit Unions and Bail Bond Companies. Get off the AMC roller coaster ride for good! © 0 - 2019 Appraiser Income. All Rights Reserved. Appraiser Income provides Appraiser Marketing Tips and Advice and publishes an annual Appraisal Management Company Directory. 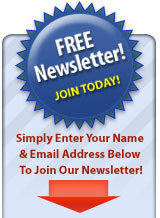 The free marketing tips and advice offered on this website is in no way implying a guarantee of income. We do not assume responsibility for any profits or losses based on your marketing efforts. 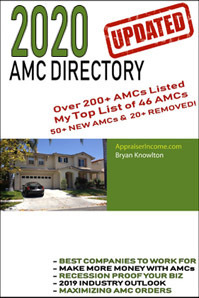 The AMC Directory and No More Middlemen Guides both provide a list of companies you can market your services to. But we do not guarantee you will receive orders or make money from them. These are trade publications with a list of the companies and marketing tips and advice that I use to make money as a real estate appraiser. Your results will vary.